A remarkable warming of the sub-surface Pacific waters east of the Philippines in recent decades, due to a shift in atmospheric circulation patterns and ocean currents that began in the early 1990s, could be responsible for the rapid intensification of Super Typhoon Haiyan. Hurricanes are heat engines, which means they take heat energy out of the ocean, and convert it to kinetic energy in the form of wind. It's well-known that tropical cyclones need surface water temperatures of at least 26.5°C (80°F) to maintain themselves, and that the warmer the water, and the deeper the warm water is, the stronger the storm can get. There is growing evidence that climate change is causing more extreme weather disasters such as the Philippines typhoon, David Cameron said. In remarks likely to infuriate the green sceptics in his party, the prime minister gave his first acknowledgement that global warming may be linked to increasingly intense storms across the world. The United Nations meteorological agency has found the effects of climate change are making the impact of severe storms like Typhoon Haiyan worse. The World Meteorological Organisation's Michel Jarraud says Australia's record-breaking summer helped push average global temperatures higher this year, and rising sea levels worsened the situation in the Philippines. "What my country is going through as a result of this extreme climate event is madness... The climate crisis is madness. We can stop this madness. Right here in Warsaw. Typhoons such as Haiyan and its impacts represent a sobering reminder to the international community that we cannot afford to procrastinate on climate action... Science tells us that simply, climate change will mean more intense tropical storms. As the Earth warms up, that would include the oceans. The energy that is stored in the waters off the Philippines will increase the intensity of typhoons and the trend we now see is that more destructive storms will be the new norm." 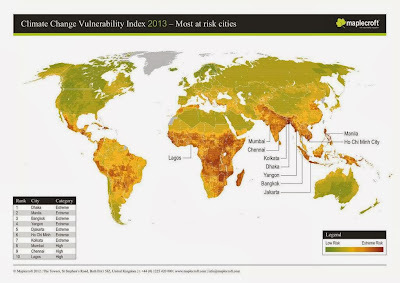 "Eastern Asia has been hard hit by weather-related loss events in the past three decades. Their number has increased by more than a factor of four, causing overall losses from weather-related events of some US$ 700bn during this period. The insured losses of US$ 76bn amounted to only around 10% of overall losses, with 62% of these attributable to Japan. 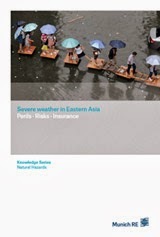 Floods caused 56% of the overall losses in Eastern Asia, but only 30% of insured losses. The number of floods has increased strongly and is expected to increase further in the coming decades. With insured losses of US$ 16bn, the 2011 Thailand floods caused the biggest-ever weather-related insured loss in the region. After floods, it is typhoons that cause the greatest weather-related losses. New analyses indicate a clear cycle of activity for typhoons, and increased typhoon activity is expected over the coming years. ."
"Nowhere in the world are weather risks changing faster than in Eastern Asia"
"Six of the 10 costliest typhoons in the Philippines, typically in hundreds of millions of dollars, also occurred in the past decade (Fengshen/ 2008, Parma and Ketsana/ 2009, Megi/ 2010, Nesat/2011 and Bopha/2012). Notice the yearly succession." 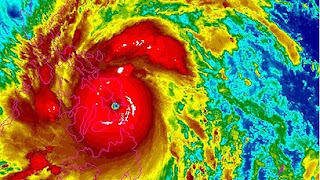 Nature journal: "Did climate change cause Typhoon Haiyan? "There is limited evidence that warming oceans could make superstorms more likely." "Was Haiyan the strongest storm ever measured? Apparently, yes. With sustained wind speeds of more than 310 kilometres per hour, Haiyan was the most powerful tropical cyclone to make landfall in recorded history. The previous record was held by Hurricane Camille, which in 1969 hit the state of Mississippi with wind speeds of just over 300 km/h." The recent oceanic warming is happening at a historically unprecedented rate: "rate of change in ocean heat content is 15 times greater now than it’s been in the last 7,000 or 8,000 years"
Mary Ann Lucille Sering, head of the Philippine government's climate change commission, warned earlier this year that her country faced a deepening crisis that it could ill afford financially and in human terms. Typhoon-related costs in 2009, the year the commission was created, amounted to 2.9% of GDP, she said, and have been rising each year since. "Extreme weather is becoming more frequent, you could even call it the new normal," Sering said. "Last year one typhoon [Bopha] hurt us very much. If this continues we are looking at a big drain on resources." Human activity-related "slow-onset impacts" included over-fishing, over-dependence on certain crops, over-extraction of ground water, and an expanding population (the Philippines has about 95 million people and a median age of 23). Data compiled from the US National Oceanic and Atmospheric Administration shows sea temperatures were about 0.5 to 1 degree above normal in the waters to the east of the Philippines as Haiyan began forming. The waters cooled in the storm's wake, an indication of how the storm sucked up energy. "future projections based on theory and high-resolution dynamical models consistently indicate that greenhouse warming will cause the globally averaged intensity of tropical cyclones to shift towards stronger storms, with intensity increases of 2–11% by 2100.... higher resolution modelling studies typically project substantial increases in the frequency of the most intense cyclones, and increases of the order of 20% in the precipitation rate within 100 km of the storm centre.